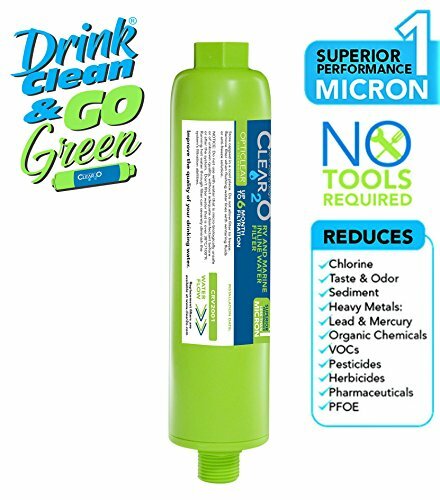 The Clear2O Go Green Water Filter easily connects to any standard water or garden hose connection without tools. When camping water is necessary for drinking, rinsing, and showering the Clear20 water filter keeps sediment out of your RV water tank and to improve the taste and smell of your drinking water. The Clear2O Go Green Filter has been independently tested to meet or exceed water quality industry standards for reduction of chlorine, lead, volatile organic compounds (VOC) such as benzene and trihalomethanes, and other harmful contaminants. The solid carbon block technology also reduces herbicides, pesticides, pharmaceuticals, industrial wastes, and perfluorooctanoic acids (PFOA's) from your water. Each filter will last up to six months depending on use. SUPERIOR WATER FILTRATION proprietary solid carbon block filters contaminants down to ONE MICRON. That's 70 times smaller than a human hair! Other RV filters only filter to 100 micron. ELIMINATES the unpleasant sulfur taste and odor from campground water. Reduces Bad Taste, Odors, Chlorine, and Sediment from your drinking water and showering, cleaning, and rinsing. Provides clear, fresh water for all of your needs. DURABLE & WIDE BODY DESIGNED for higher capacity and flow with solid block carbon filter to reduce contaminants. IDEAL for RV and marine users. Up to 6 months depending on use. PROTECTION & CONVIENIENCE of storage end caps included. If you have any questions about this product by Clear2o, contact us by completing and submitting the form below. If you are looking for a specif part number, please include it with your message.